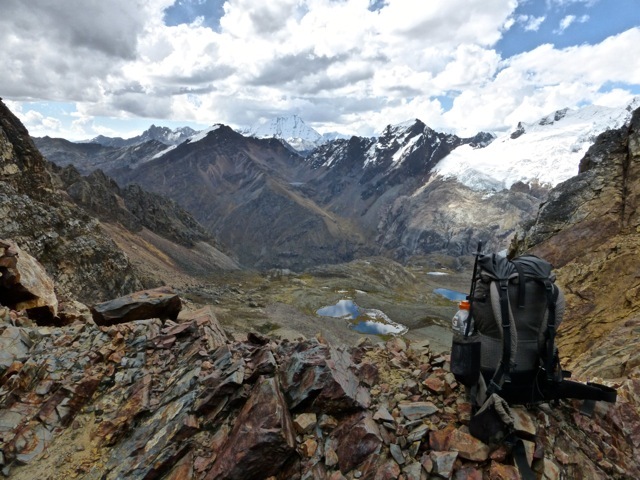 Alpenvereinskarte (German Alpine Club): Consists of two 1:100,000 maps that cover the entire range – 0/3a Cordillera Blanca Nord & 0/3b Cordillera Blanca Sud. Skyline Adventures: Also two maps split into north and south. Both are 1:75,000. 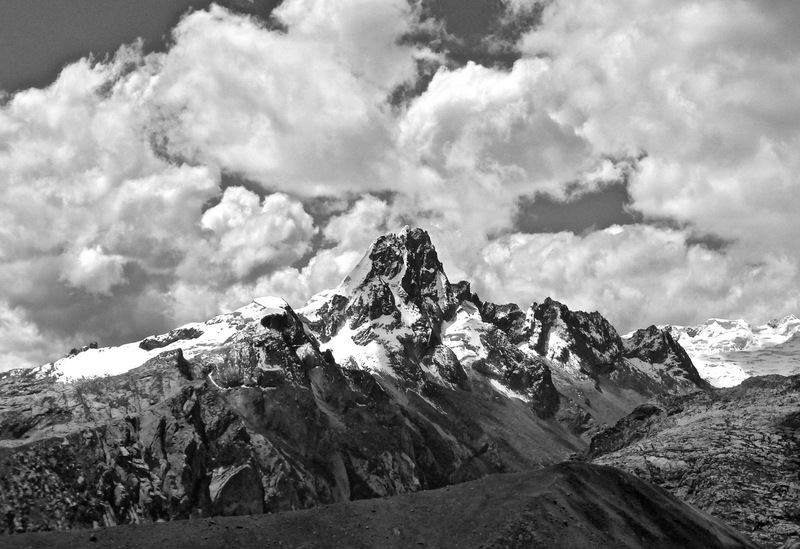 The Skyline maps do not cover the most southern part of the Cordillera Blanca range. Six of the twenty-three passes in the CBT were of the uncharted variety. 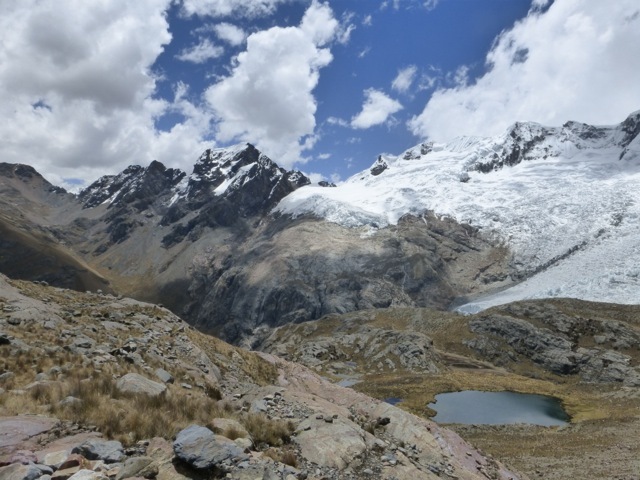 Whether or not I was able to find a way up and over these trailless high points, would ultimately dictate the viability of the Cordillera Blanca Traverse as a thru hike. 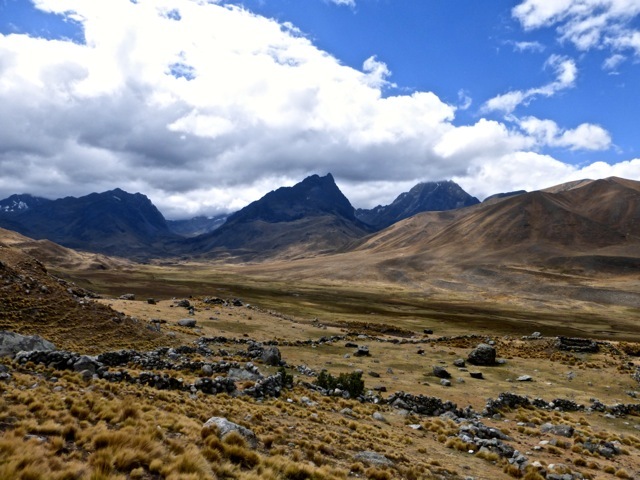 The third stage from Pitec to Chavin included three such passes; namely Shallap, Cashan and Rurec (lowest and easiest of the trio). 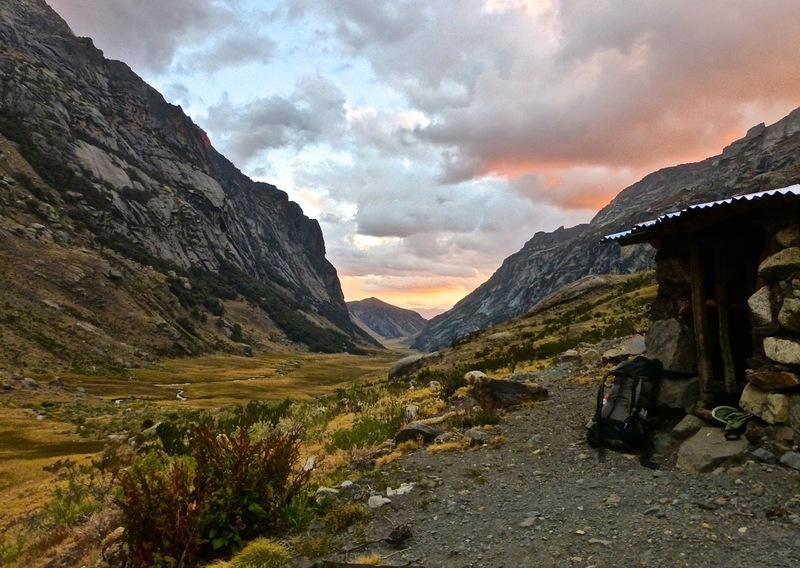 Upon arriving back at the Pitec trailhead, I met a park ranger by the name of Pedro. Pedro the Park Ranger. Not a bad name for a Discovery Channel series. He eventually came around, and by the end of our conversation he was enthusiastically doling out route advice for the upcoming section and beyond. I set off for the Quebrada Shallup around 9.15am. 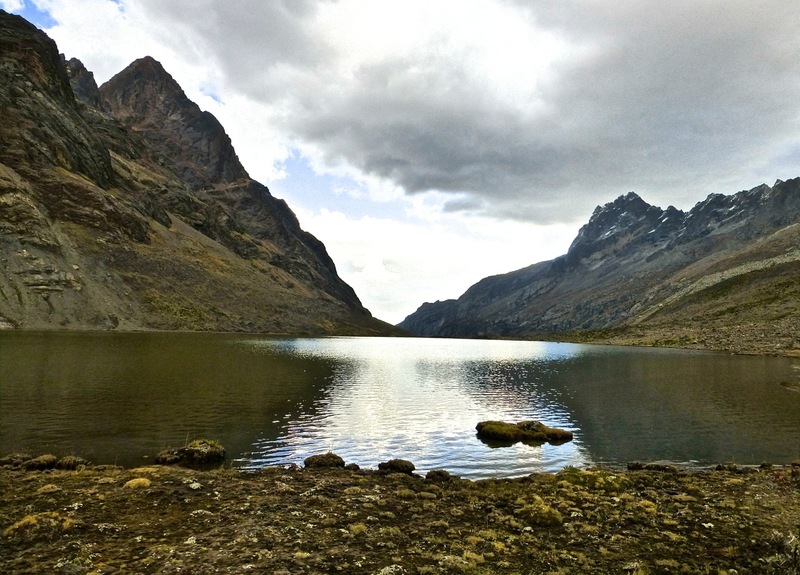 The original idea had been to hike up to the valley’s eastern terminus, and then ascend the slopes/cliffs immediately to the south of the jade coloured Lake Shallup. Plans changed after chatting to Pedro. 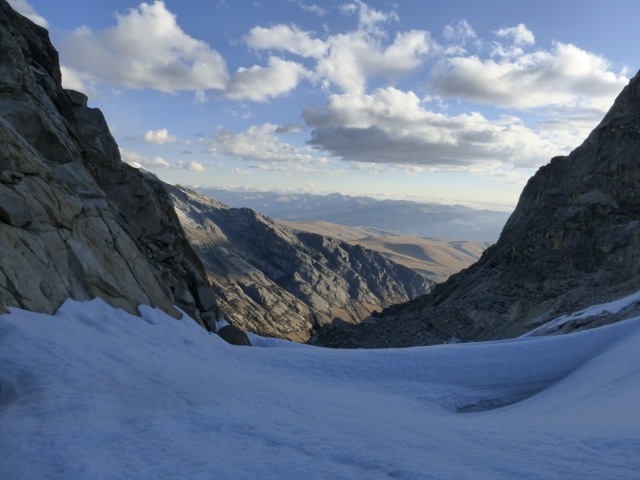 He was adamant that the superior route up and over to the next valley lay further west. Despite some reservations, I followed his advice. After checking out the gorgeous Lake Shallup, I retraced my steps back down the valley and ascended at the point that Pedro suggested. Slowly but surely, I kicked steps and switchbacked my way down. After about 45 minutes I was clear of the icy snowfield. Darkness had fallen. The final hour of the descent was made by headlamp. Picking my way through a combination of scree and overgrown terrain, I reached the bottom of the Quebrada Rajucolta just after 6 pm. It had been a challenging day. Time for food and sleep. I made a latish start. Just a few miles of easy dirt road walking to Lake Rajucolta. After a scenic breakfast overlooking the lake, I began to climb. Again. The views were magnificent. 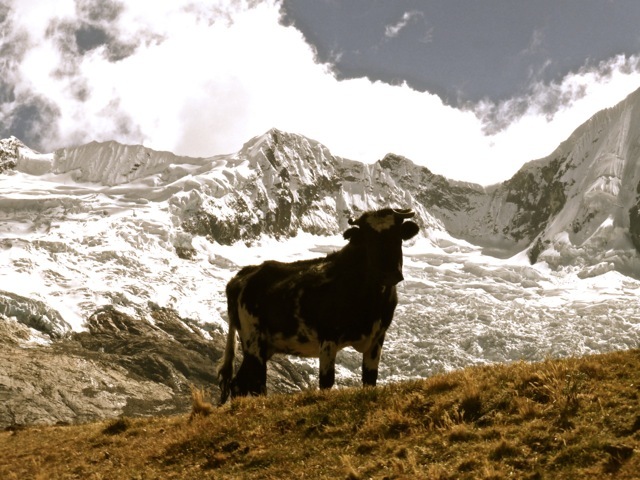 Snow capped peaks, alpine lakes and at around 4800 metres above sea level, I had the Peruvian equivalent of a “Mexican standoff” with a high altitude bovine. 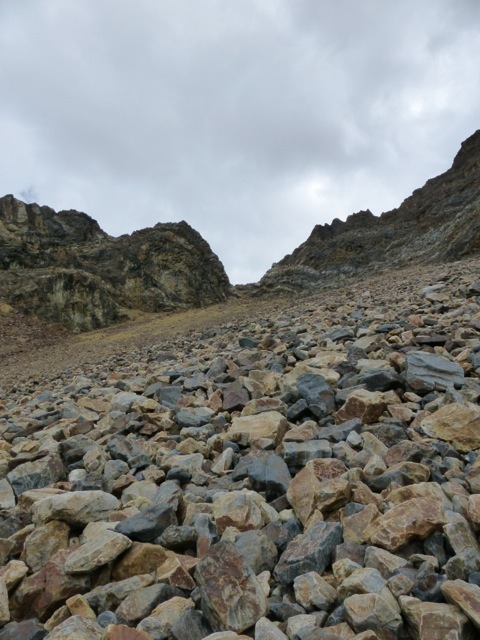 The final half mile to the pass was scrambling up a steep scree slope. Two steps forward, one step back. I drifted to the side of the field where the footholds were occasionally solid. 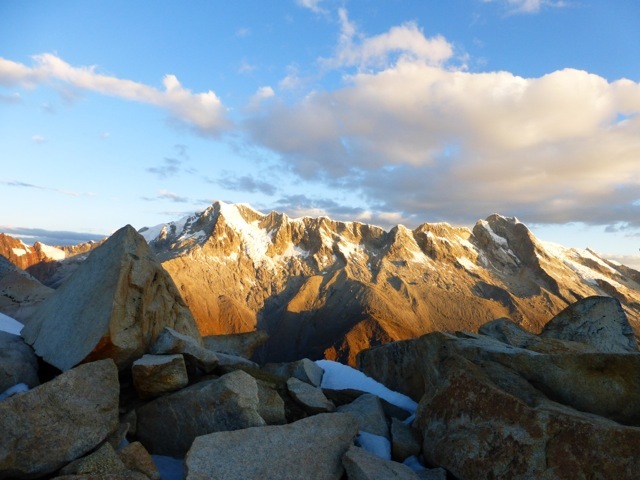 Not long after midday I attained the 5143m (16,873 ft) Cashan Pass. Descending from the pass into neighbouring Rurec valley, the scenery was once again impressive. It was raining steadily and temps were just above freezing but I didn’t care. 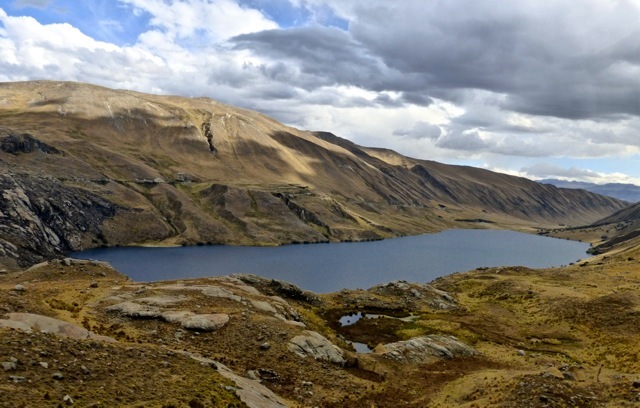 At each and every turn there were glaciers, streams, boulder fields and most notably, the stunning Lake Tarahua. With an hour of light remaining, I began to look for camping options. Not much in the way of trees at these altitudes; sheltered areas are a dime a dozen. As I gradually descended, I spotted a lonely structure off in the distance. No one else around. Worth an inspection. It was a shepherd’s hut. From the dusty, unkempt interior, it looked like it hadn’t been used in a while. As I weighed up my options…….”should I stay or should I go?”………it began to rain heavily. Decision made. Over the years, I can’t recall the amount of times that I have come across random unexpected shelters in the middle of nowhere right when they were needed. Huts, caves, overhangs, lean-tos. Karma? Luck? Being observant? A combination of all of the above? Using my tent as a groundsheet, I spread out my wet gear, laid out my sleeping mat and settled in for the night. I lay awake until 11pm. Listening to the rain on the metal roof and reading Robinson Crusoe. It was the first time that I had revisited Defoe’s classic since I was 16 years old. Sitting just below the high point on the other side, I spied the route ahead. My original idea had been to drop straight down and bee-line it across the valley floor. However, I was forced to rethink upon seeing the swampy nature of the terrain below. 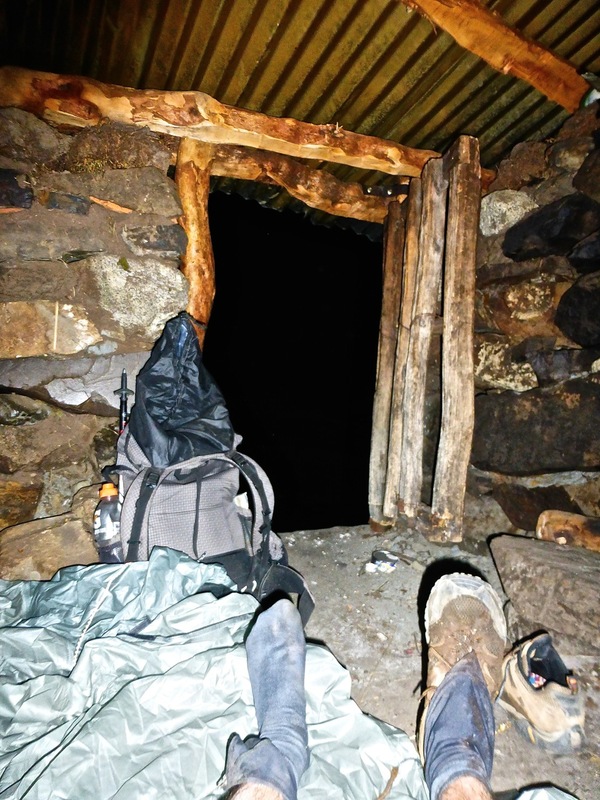 Skirting around to the SW via some dilapidated walls, I passed by more shepherds huts and quickly reached the other side of the Quebrada. 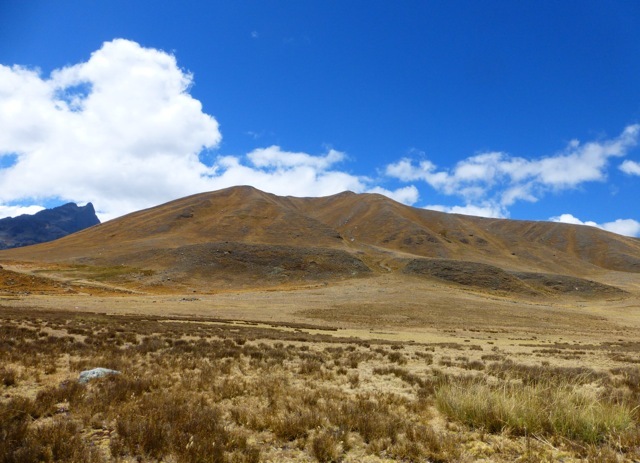 My goal was a windswept ridge which according to my maps, looked like it would take me a good part of the way towards Lake Queracocha, the ending point of stage 3. This turned out to be the case. I spent the next few hours walking into 40 mile an hour winds along the featureless crest. With the spectacular Pukaraju peak looming to the east, the route was pretty much a straight shot south. I couldn’t help but be reminded of the Scottish highlands. Just a drier, high altitude version……….without the promise of a pub or inn at day’s end. As 3 pm rolled around, I went up and over the final pass of the day. A relatively gentle affair at 4600 metres. No scree, not particularly steep, just a long funnel of overgrown tussock grass. 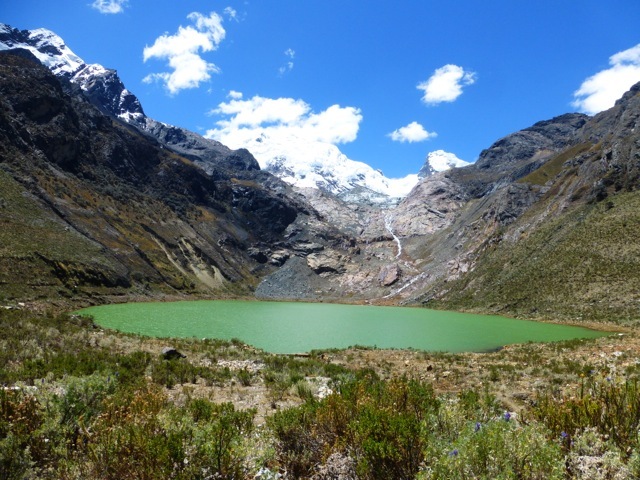 From the pass it was a relatively easy descent to Lake Queracocha. Not too much in the way of trail, but navigating was easy enough in the open terrain. I made it to the road overlooking Querococha just after 5pm. 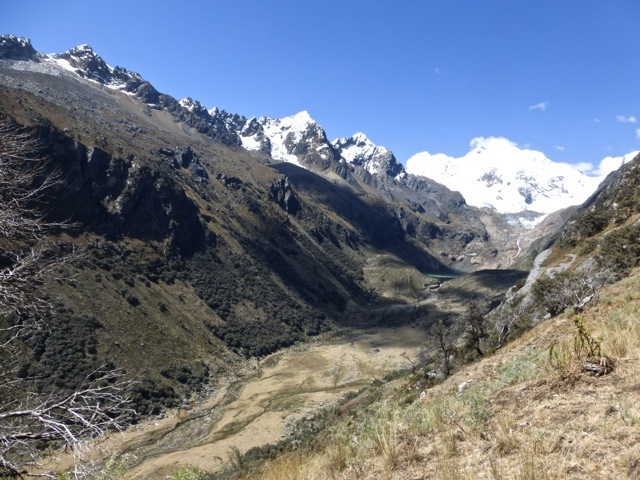 Not more than 10 minutes later I had flagged down a packed-to-the-brim minibus bound for Chavin, a small town situated on the eastern side of the Cordillera Blanca. I somehow managed to squeeze in between a cheery local lady holding her toddler, and an ancient gentleman who must have been pushing 120. I stayed the night at a comfortable hotel on the main plaza. Went out for dinner, watched some tennis on TV and slept like a bear in winter until awoken by church bells at 7am. 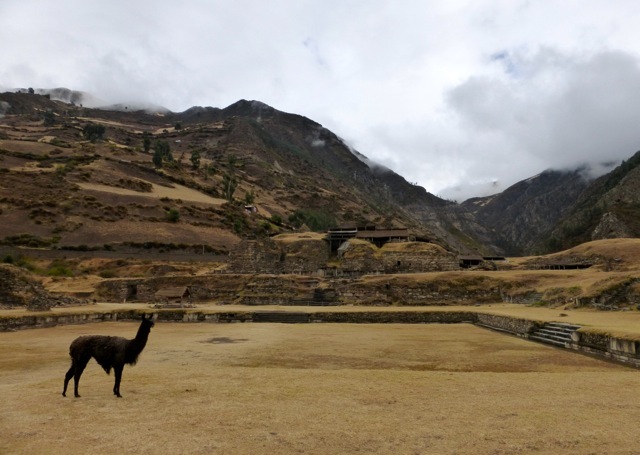 The following morning I spent a few hours exploring the impressive archeological site (which I had previously visited in 1996) of Chavin de Huantar. 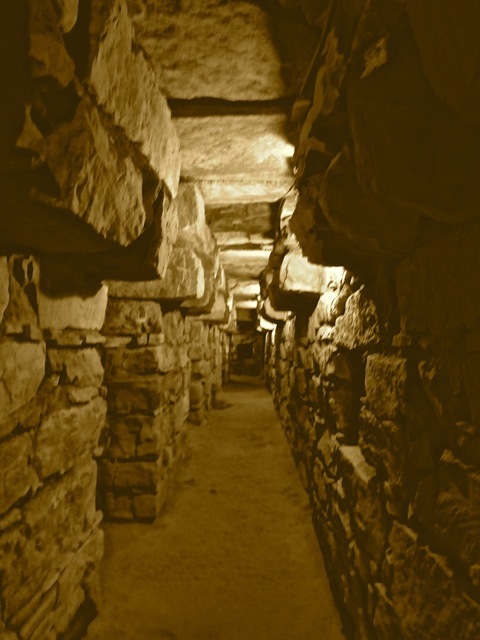 Dating back more than 3000 years, it represented the religious centre of the Chavin people, one of the major pre-Inca cultures of Peru. 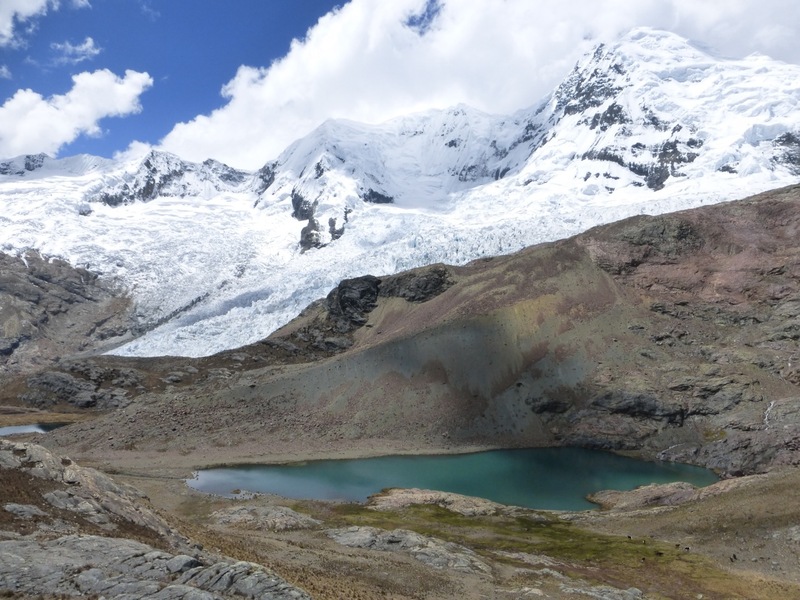 By midday I was back at Lake Queracocha, ready to begin the fourth and final stage of the CBT to Pastoruri Glacier.